There is absolutely nothing that makes me happier than seeing Bimmer smile. (Remember when I got super psyched about taking her to a Disney Junior Live event a few months back?) 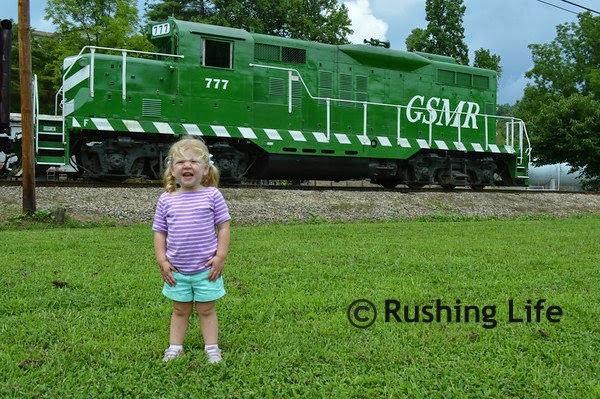 So when I stumbled across a special trip the Great Smoky Mountain Railroad was doing based on one of her favorite shows, Dinosaur Train, I couldn't buy tickets fast enough! Thankfully I found it in time... we got tickets for the last weekend they were doing it! Bryson City, NC, is a several hour drive from the house, but I was so pumped (and trying to pump Bimmer up) that it didn't matter! The weather gods were also on our side that day - before we left the house, they were calling for 100% chance of rain! But thankfully, the only drops we saw were literally when we were pulling back into the depot at the end of the day! Bimmer was so pumped up! We boarded early (which wasn't our wisest move ever) but when the train started to move, ohmigod, you would have thought I just gifted her with 20 pink ponies! The train ride itself was pretty anti-climatic for me and Puff. I think the train ride they normally do in the fall to see the leaves is a lot longer and on a prettier route, so maybe we'll do that in a few years. But Bimmer loved it... she was pointing out the trees and the "ocean" (aka a river) and she was soooo excited when we crossed a bridge and everytime they would beep the horn, she would put her hand up to her mouth and giggle. 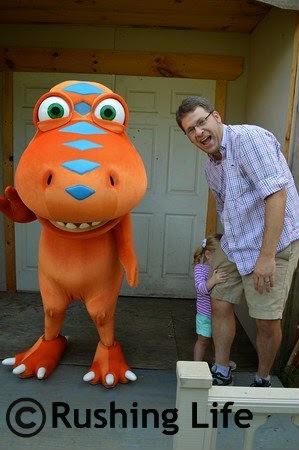 The Dinosaur Train that we did stopped at an area they had all set up with special events for the kids. Buddy the T-Rex from the show was outside waving to everyone as the train pulled up. Bimmer loved the bouncy castle and slide, the temporary "tat-toe" she got on her hand, and digging for "fossils." She wasn't too keen on the whole meeting Buddy thing at first. 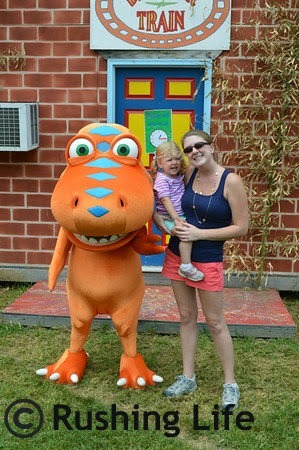 Although, thankfully, later she decided that if we held her, it was totally OK.
All told, it was such a fun family day. She was telling me later that Buddy is a T-Rex and that Tiny (who is a pteranadon) flies and eats fish. 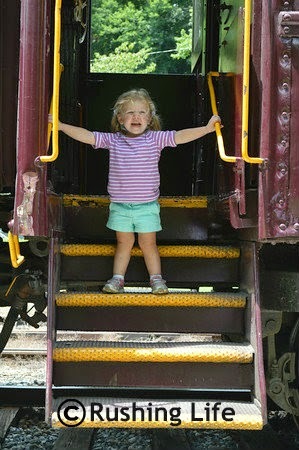 She would yell "All aboard!" and "Time Tunnel!" on the train too. 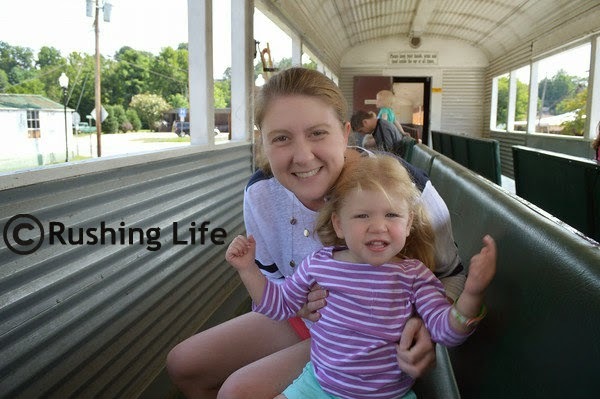 I love that she is learning so much from that show, loves it so much, and that we were able to give her this real life Dinosaur Train experience. 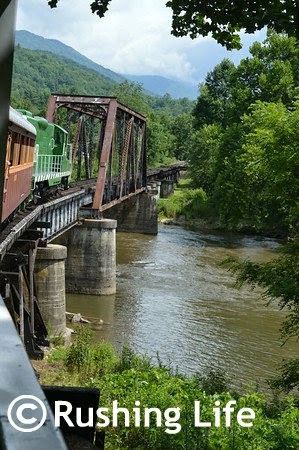 And I would be slacking in my blogging duties if I didn't mention how cute the city of Bryson City, NC, is! We wished we weren't so tired and had had more time to explore the town and surrounding waterfalls. And I must give a shout out to La Dolce Vita Bakery, which was just across from the depot. We scored delicious homemade bagels before the ride, and stopped for homemade gelato (the strawberry cheesecake was fab) after the trip, and then took home some amazing cupcakes - guava with mango for Puff, and banana salted caramel for me! 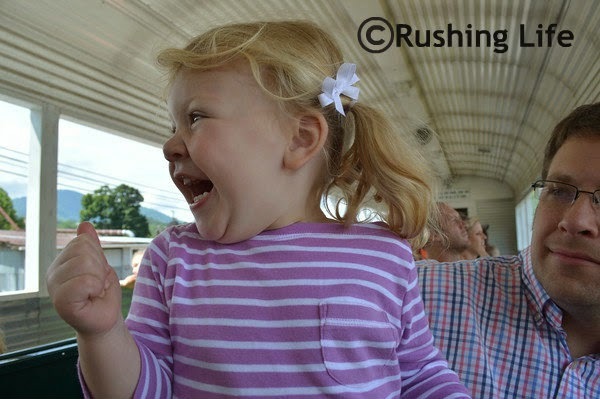 So blessed that Bimmer was able to "ride, ride, ride, ride, ride.... the Dinosaur Train!"